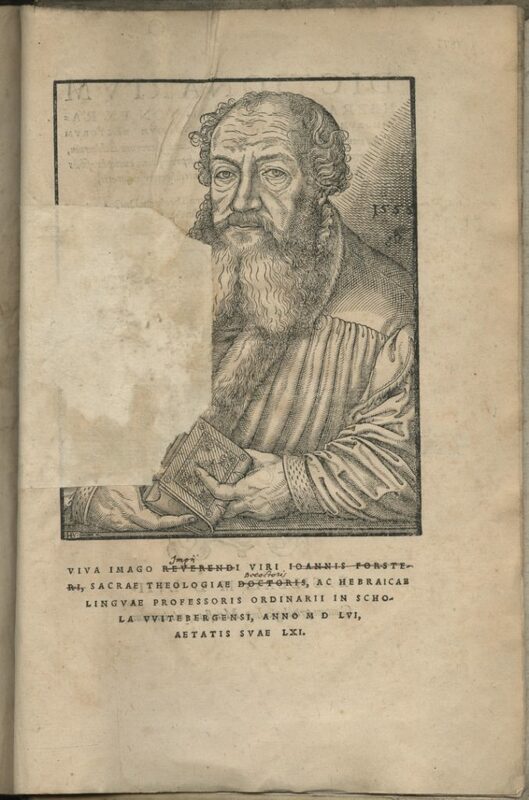 In his Hebrew dictionary, Forster, a Lutheran, claimed on the basis of his interpretation of the Hebrew word `Asah that the Eucharist merely commemorates the sacrifice of Christ but does not denote his real presence. His opponents’ assertion that this word conveys the idea of sacrifice merely reflected their impiety and idolatry, he argued. Pierre Bullioud, a Catholic jurist from Lyon, strongly objected to Forster’s theory. 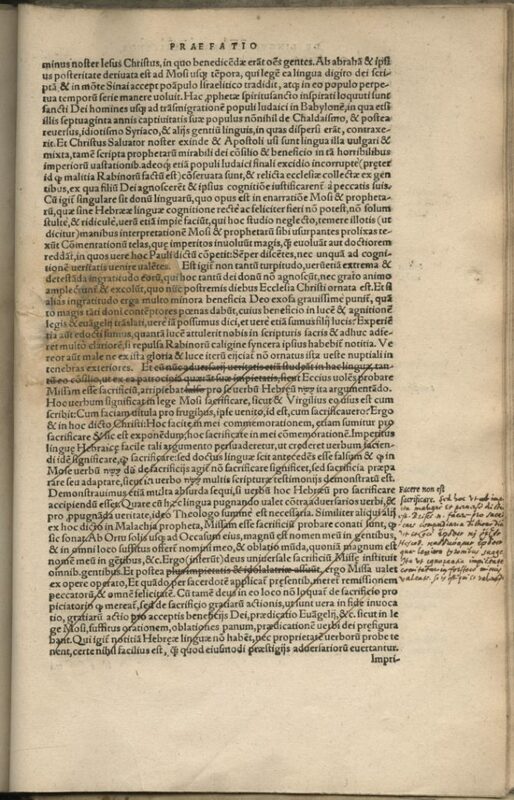 Accordingly, he crossed out the entire passage and noted references in the margin to Priscian and Hesiod that support the reality of the sacrifice and divine presence in the consecrated host during. 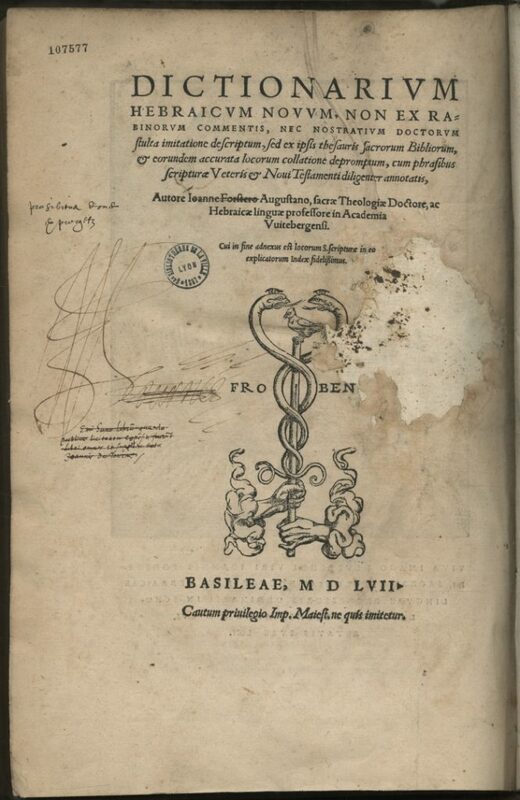 Bullioud also vented his dislike of Forster by crossing out the words “reverendus” and “doctor” under the author’s portrait and replacing them with “impius” and “decoctor”. The title page bears a reminder of a tragic episode in the history of Lyon and replaces Pierre Bullioud’s library in the context of the religious conflict that engulfed the city during the latter half of the century. Under the signature of Jean II de Tournes, a note in Bullioud’s hand states: “I bought this book at a public sale of all the books and belongings of Jean de Tournes”. The sale, in 1589, of the books and possessions that Tournes left in Lyon when he was forced to leave for Geneva in 1585, and that, despite his repeated attempts, he was never able to recover, earned 725 écus for the consulate, part of which was collected by the city. 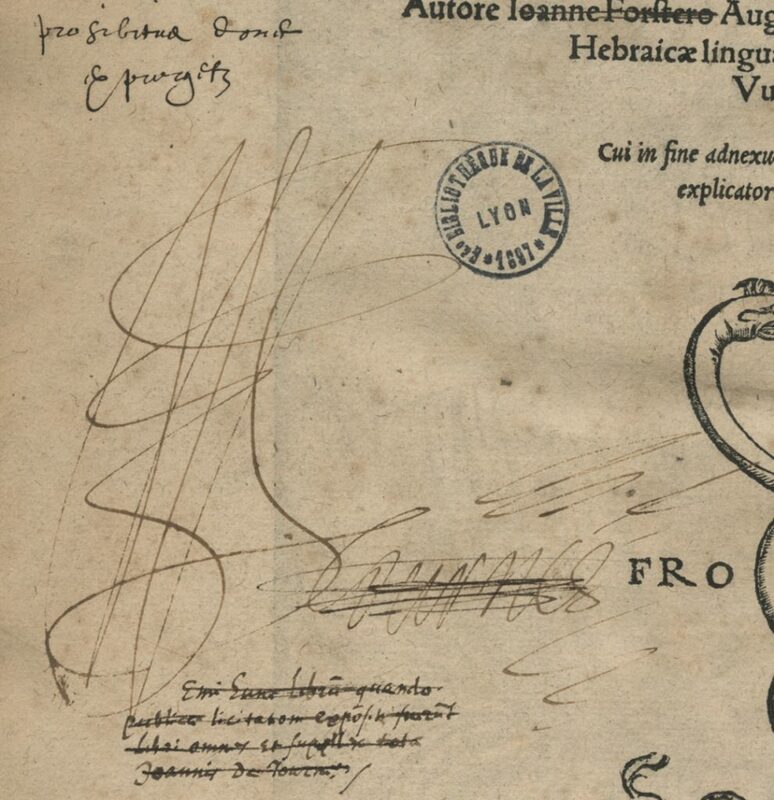 After François Bullioud donated the book to the Jesuits of the Collège de la Trinité in Lyon, in 1610, an inscription was added at the top of the page: “prohibitus donec expurgetur”, or “prohibited until expurgated”.